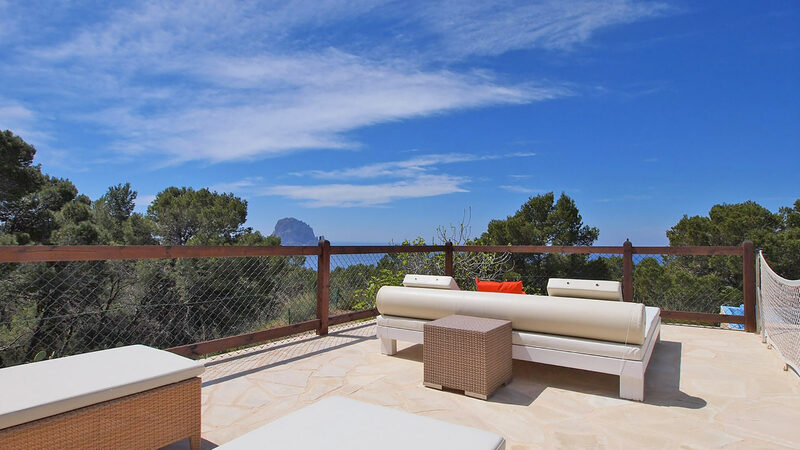 Peaceful country villa, exclusively located in a green protected area overlooking Es Vedrá Island, one of the most beautiful sceneries of the West coast. This Ibicenco style finca has been carefully renovated, and its 250 sqm of living space guarantee a comfortable stay. The villa overlooks a large 7,000 sqm plot, completely fenced to assure your privacy. The village of San José is just 5 minutes drive and Ibiza town, 25. Convenience store and coffee shop are just 1km away from the villa. The view the outdoor facilities (veranda, grill, pool, day beds etc). That was simply outstanding. Very warm and hospitable staff, especially the housekeeper/cleaning lady. Jorge who checked us in was great too. The view and infinity pool were spectacular. It also was great that all of the bedrooms had air conditioning. VillaNovo was excellent. Riad was timely in his messages, and check-in / check-out worked exactly as planned. Thanks for a great holiday!